Lyon Opera Ballet can be counted on to bring interesting repertory to New York. Last year, at BAM, it performed Christian Rizzo's ni fleurs, ni ford-mustang, a somewhat impenetrable, glacial performance work that exploded into ecstatic dance only in its final minutes. This year, it presented at the Joyce works by three buzzy choreographers: William Forsythe, Benjamin Millepied, and Emanuel Gat. The dances by the first two put to ample use the company's ballet training. Steptext, by Forsythe, dates from a relatively early 1986. Women are on pointe, and the movement is frenetic and all-out, pushing our expectations of the athlete/dancers. There is still a casualness to the affair; moves sometimes ended abruptly and petered out in a walk, rather than a tightly closed fifth or fourth position. Millepied's Sarabande (2009) has a similar dance-and-dash quality. 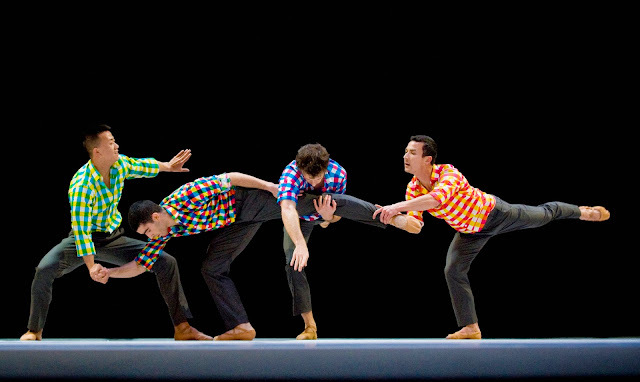 Four men in nifty, colorful shirts noodle and play with the ballet steps they're given, interacting at moments with the on-stage violinist or flautist (reminiscent of Jerome Robbins). Gat's Sunshine drew particularly on the idea of a group—reliance on one another, assembling and breaking apart, pushing through the fourth wall to draw in the audience. Gat's lucid lighting scheme seemed to add vast dimensionality to the stage. His movement, so distinctive when he began choreographing a decade ago or so, has expanded to encompass a vocabulary that feels similar to a number of Europeans working today. But his theatrical sense remains fascinating. A couple of weeks later, Hubbard Street Dance Chicago arrived at the Joyce for a two-program run over two weeks. 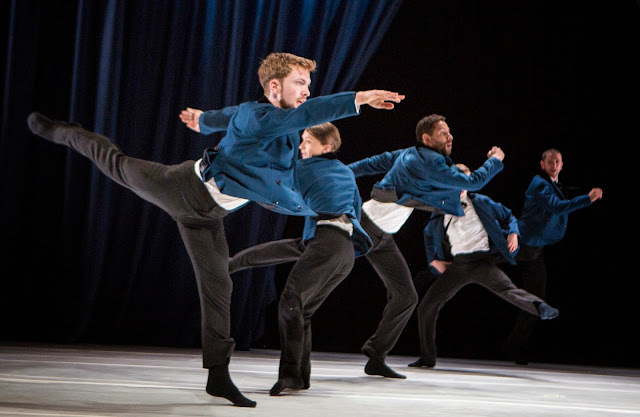 Years ago, under the artistic direction of Glenn Edgerton, this company shifted its focus from jazzy fare toward the European ballet-influenced modern style, more akin to (and including repertory by) Kylian and Forsythe. It is a more global approach, and the company's dancers do well in the elastic, sock-clad movement. However, in the matinee I caught on May 16, many of the five dances on the program blended together stylistically. 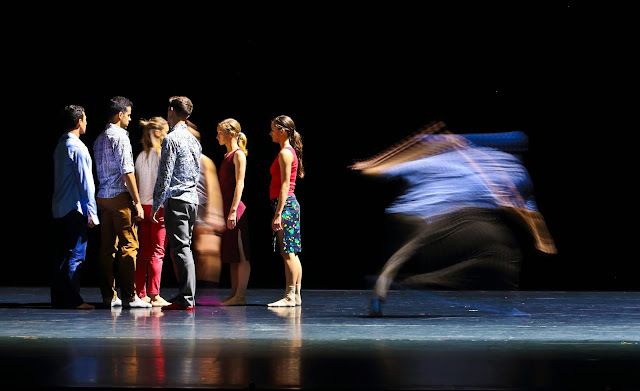 Two works by resident choreographer Alejandro Cerrudo displayed his seamless, organic movement, lovely and harmonious, but after 20 minutes or so, ultimately monodynamic and in the case of Second to Last (Excerpt), the use of Arvo Part's very familiar music did nothing to distinguish it. Crystal Pite's new solo, A Picture of You Falling, with text by Pite spoken by Kate Strong, was danced powerfully by Jason Hortin. It follows in the dance-theater canon of movement plus words, in stark lighting. And Robyn Mineko Williams, a longtime Hubbard dancer turned choreographer, contributed Waxing Moon, a trio. While the movement was slightly more angular and spasmodic than Cerrudo's, the tasteful black costumes, stark lighting, and long string of duets unfortunately felt very similar to the previous dances. What did stand out, for puzzling reasons, was I Am Mister B, by Gustavo Ramirez Sansano. The choreographer danced in Balanchine's Theme and Variations, and in theory this premiere is a celebration of Tchaikovsky's ebullient music, and an elegy to Mr. B. The women and men both wore blue dinner jackets, white shirts with narrow black ties, and black pants, to evoke the subject. This faithfulness to wardrobe fell flat when it came to footwear, which was the Hubbard's current rep default—socks. Three sets of semi-transparent copen blue curtains that reeked of a fusty baroqueness fell and rose periodically, compartmentalizing or opening up the stage. The dancers sprang and thrust their pelvises forward, chopping at the air with bent arms. One man spoke some lines so rapidly that I couldn't understand him. Perhaps they held the key to the work. Sansano's choreography is his own interpretation of the music that has nothing to do with Mr. B's classic. It felt as if Sansano loved the music so much, yet didn't want to do an end-run around Balanchine, that he worked in the conceit of the character of Balanchine, maybe breaking loose after a performance of Theme and Variations. What made it even more confusing was the fresh, sweet memory of seeing Herman Cornejo and Sarah Lane lead ABT in Tuesday's Met performance of Theme and Variations. Besides Balanchine's Symphony in C, there is perhaps no plotless classical ballet more musically adept and in concert with its score. Hubbard Street's dancers continue to be outstanding performers, but I wonder if the repertory isn't too similar to draw on all of their talents. Maybe one piece without socks?